Not written for long since I’ve been running around and busy. I’m working full time at Greyhound in the city, but haven’t made decent living arrangements, so I only get back to Berkeley a few times a week where all papers and letters are on desk in big mess. I stay over in city on various couches on workdays, since I’ve been back I haven’t had time to really sit down in leisure and figure out what to do about living arrangements, I almost moved back into SF tho I hate to give up this cottage, and was in fact supposed to this weekend but too many things came up and I can’t find more time. I am really all up in the air. Mainly I’m waiting for a ship or some equivalent moneymaking project since I do want to leave here and take off for Europe sometime this year. Meanwhile the Greyhound job brings in 50 a week, Seattle debts are being cleared off this month. I’m also surprisingly enough teaching one class a week at S.F. State College—State is the school that’s been promoting poetry workshops, readings, etc. and I am not the local poet-hero so was invited to occupy the chair of guest gorilla at their writing class. I work with another regular teacher who handles all the details, registration, mimeographing of poems to be handed out and discussed etc, and I act as pro in conducting discussions. The class is about 20, half old ladies and half hip young kids who have been attracted by all the recent activity. My teaching technique could shock you undoubtedly and certainly get me kicked out of anywhere else or not be countenanced, I bring in bums from North Beach and talk about marijuana and Whitman, precipitate great emotional outbreaks and howls of protest over irrational spontaneous behavior—but it does actually succeed in communicating some of the electricity & fire of poetry and cuts through the miasmic quibbling about form vs. content and does this phrase “work” and is that line “successful” and are all those “p & f” sounds too intense, etc. The woman who runs this program is a Prof. Ruth Witt-Diamant who has dug my work—there appears to be, according to Rexroth, a semi major renaissance around the west coast due to Jack and my presence—and Rexroth’s wife said he’d been waiting all his life hoping for a situation like this to develop. The thing I do in class is get them personally involved in what they’re writing and lambaste anything which sounds at all like they’re writing “literature” and try to get them to actually express secret life in whatever form it comes out. I practically take off my clothes in class to do it. The students all dig it and understand and the class is now grown weekly to where it’s too big to handle, starting with 8 and ending with 25. W.C. Williams read Howl and liked it and wrote an introduction for the book; and meanwhile there is the possibility of expanding and making a whole book of poems. We put on another reading in a theatre here in Berkeley, I read some other poems, Whitman, The Sunflower, and a new poem called America—a sort of surrealist anarchist tract—all of which came off very well, so the publisher is now interested in a book full of representative work not just the one poem. The reading was pretty great, we had traveling photographers, who appeared on the scene from Vancouver to photograph it, a couple of amateur electronics experts who appeared with tape machines to record, request from State college for a complete recording for the night, requests for copies of the recordings, even finally organizations of bop musicians who want to write music and give big west coast traveling tours of Howl as a sort of Jazz Mass, recorded for a west coast company called Fantasy records that issues a lot of national bop, etc. No kidding. You have no idea what a storm of lunatic-fringe activity I have stirred up. On top of that the local poets, good and bad, have caught up and there are now three groups of people putting on readings every other week, there’s one every weekend, all sorts of people—this week Eberhart (Richard) arrived in town for readings at State, there is a party for him tonite, I was invited to give a private reading, refused (sheer temperament), to meet a group of jazz musicians and discuss the possibility of making some form of jazz-poetry combo. There is also another group of musicians, the leader of which used to arrange for Stan Kenton who wants to record with me. Finally I was asked to write an article which I haven’t gotten around to do for Black Mountain Review, & also contribute to two literary magazines starting here. Bob LaVigne, a painter whose work I’ve been buying and digging, has been putting up wild line drawings to plaster the walls of the readings an painting fantastic seven foot posters á la Lautrec. Really a charming scene. My big problem now is not having enough time to do all I could, working at Greyhound and not having moved out of Berkeley, so I get little time for actual writing anymore—it will be a relief to get out from under and away on a ship or up to Alaska possibly on a fishing industry job. Rexroth’s house—Friday evenings, open house, 2 weeks ago Malcolm Cowley, I got drunk and made a big inflammatory speech denouncing him for publishing Donald Hall as a commercial snot and neglecting & delaying Kerouac, a funny scene, no blood spilled; last weekend [Richard] Eberhart there, a long non drunken recollection of a party we’d met at in NY five years ago, he remembered the conversation in detail, I’d just got out of hospital and was hung-up on the religious experience in the Groundhog poem. 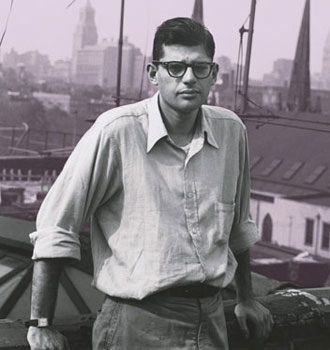 From The Letters of Allen Ginsberg. Edited by Bill Morgan. Cambridge: Da Capo Press, 2008, p. 128-30. Transcript of Allen Ginsberg on how D.H. Lawrence and Walt Whitman affected the open verse form.